Home>Blog>Buyer's Guide Fabrics>What is Trevira CS? Research into the causes of fire shows that unsuitable textiles can contribute considerably towards a fire spreading. National and international standards regulate protection against fire. Flame retardant Trevira CS textiles meet the important international standards on fire safety, because they consist of fibres and yarns with "built-in safety". Today Trevira CS materials, however, are not being used the world over solely because of regulations on preventative fire safety, but also in contexts where it is only the design of the textiles that counts. Constantly undergoing further development, Trevira fibre and filament technology enables fabric manufacturers to continue introducing innovative products onto the market. The materials impress with their fresh effects, special structures and pleasant handle. As a result, Trevira fibres and yarns constitute not only the basis for the functionality of the textiles. Fibres given an additional flame protection finish can lose the protection as a result of wear, age or frequent washing. Flame retardant Trevira fibres are inherently flame retardant. For this reason materials made from these fibres and filament yarns are likewise permanently flame retardant. 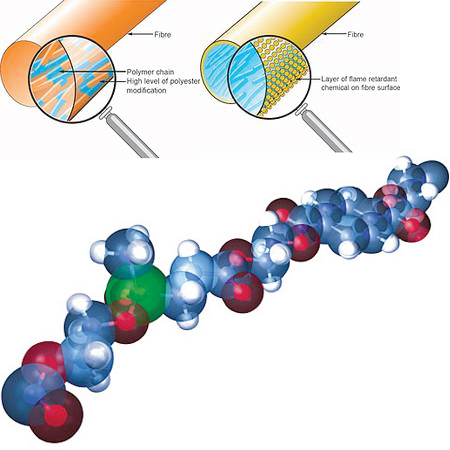 This small but decisive difference results from the chemical structure of the polyester fibre. It is not possible for external influences to affect them. This is an important argument from the ecological aspect as well. Apart from their environmentally friendly manufacture materials in Trevira CS require no additional fire protection treatment, such as normally combustible materials need. Treatments of this kind are harmful to the environment. Flame retardant Trevira fibres and filaments are, furthermore, certified to Oekotex 100 Standard. In comparative terms only very slight amounts of toxic fumes develop in the event of a fire. ShowTex is a proud and loyal member of the Trevira CS Club, which works intensively with all customers and partners along the textile supply chain in order to secure and extend the success of the Trevira CS brand in the long term.